Dozens of historic vehicles c1920’s-1950s, many unique, including civilian modest grand and sporting. Commercial Vans & trucks and Military, wheeled, amphibious, half-tracked and tracked, etc. etc. From a 45mph 1924 sporting Amilca, to a 145mph 1958 sporting 300SL Mercedes. 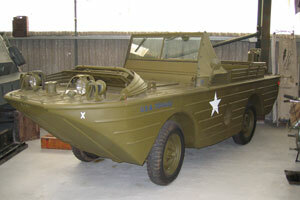 From General MacArthur’s Cadillac to Postman Pat’s Post Office van, from a WW2 Ford Amphibious Jeep to a WW2 Stuart Tank. 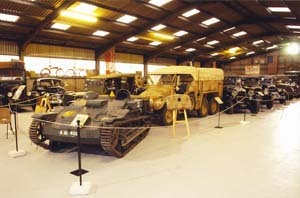 The Finest and most varied grouping of rare 1925 - 1945 Military vehicles in the UK. British, American. German, Russian, etc. 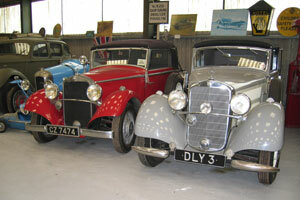 A rare display of 1930’s Mercedes Benz Military and Civilian Cars, WW2 Dispatch Rider’s Norton and 1950’s Sunbeam S.8 shaft drive motorcycles. See the vehicles used in many major Film and TV Productions from The Battle of Britain’ & The Dirty Dozen’ to Indiana Jones and The Last Crusade’, ‘Raiders Of The Lost Ark’ ‘Evita’etc. TV Productions from ‘Allo Allo’ to ‘Poirot’.